It is not easy for a mother to see her child in much discomfort after a four-hour heart operation. The best she could do for her son, Darsh Prasad, was to be by his bed­side, hold his hand and reassure him that the worst is over. The wait and the fear of the un­known were part of a three-year wait. 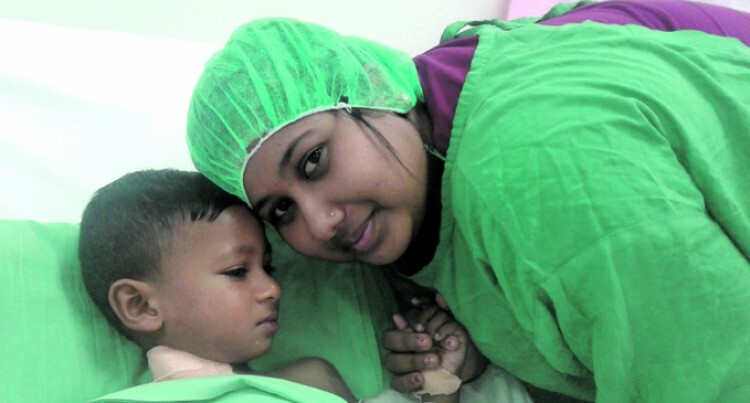 That was when she first heard about doctors who would be in Fiji to oper­ate on toddlers like her son. Preetika Gautam, of Bau Road, Nau­sori, Darsh’s mum said: “My son was only six days old when the doctor said there was a hole in his heart. “We have been waiting for this day for three years and two months. Just to get my son’s heart operation done successfully. “When my son went into the operat­ing theatre I was crying and praying that I want a smile on my son’s face after his operation. “I came for my son’s clinic which is done every six months. I came to know that there were doctors from India for heart surgeries on children. The surgery was declared successful by the doctors. The youngest baby to be operated on is two-month old Ephraim Sunia Kane. His mother, Ilivani Ganilau, 29, said it was really hard for her to see her small baby being operated on. “I am happy that I made the right decision for him to be treated by the team of doctors who came from In­dia,’’ Ms Ganilau said. Both the parents urged members of the public to take their children to the CWM Hospital for screening should they suspect their child is suffering from congenital heart disease.